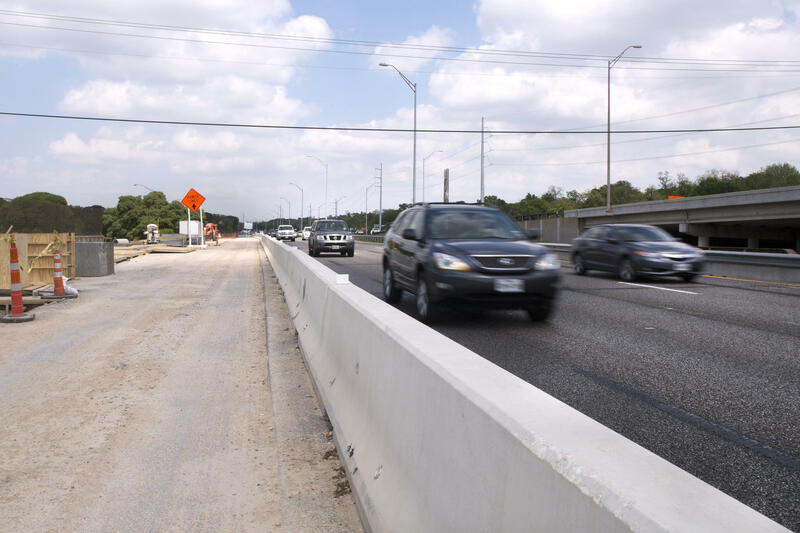 The MoPac Improvement Project will add one tolled lane in each direction to North MoPac. The lane will be free for transit. This October, on the 21st, at 4:29 PM, to be exact — civilization will mark a momentous date. It's the day we officially catch up with the moment in 'Back to the Future 2' when Marty McFly, his girlfriend Jennifer and Doc Brown arrived at in the film. The movie came out in 1989, and it's kind of fun to think back to that time and how the film imagined what our present day would be like. Some predictions have turned out to be true — keyless entry to your home, flat screen TVs, drones, smart watches and holograms. And some, of course, haven't materialized. Hey, forget flying skateboards. We were promised flying cars! A traffic-free future! Well, it's 2015, and in Austin, turns out, we do need roads. Look around during the weekday rush hour, and you'll see bumper-to-bumper car traffic on our major freeways. What was the transportation plan that led Austin to this point? "I hate to say it this way, but I will. The plan was, 'If We Don't Build It, They Won't Come,'" says Randy Machemel, a Professor of Transportation Engineering at The University of Texas at Austin. Machemel says Austin's inability or unwillingness to make transportation decisions in the past has caught up with the city. "We really didn't build a freeway system — our decision, a city decision," he says. "So we're a little deficient in capacity." To be fair, there are examples to our north and east of what would've happened if we did build lots and lots of roads, and those sprawling cities aren't exactly living traffic-free. Dallas is currently agonizing over whether to build a six-lane toll road along the Trinity River in the middle of a proposed giant park. Over in Houston, they're slowly building out a third loop to their massive freeway system, a ring 184 miles long around Houston's sprawling suburbs. But if Austin decided lots of roads wasn't the answer, perhaps it could've gone the direction Portland, Oregon did — invest in mass transit, bike infrastructure and dense housing instead of roads. Well, that didn't happen, either. Instead, Austin's policies for transportation, housing and construction have made it attractive – and cheaper – for people to live further and further away, and get stuck in more and more traffic. What's the solution? Couldn't we just add a bunch of lanes to I-35? Maybe double the size of MoPac? "It's probably not feasible to do that, from an economic, social, political and environmental point of view," Machemel says. (Add to that a physical reason: There's only so much right-of way along existing highways, in some cases, barely enough to add a single lane in each direction.) "It's not really an option," Machemel says. To see what is an option, all you have to do is drive down North MoPac these days and look to your left and right. 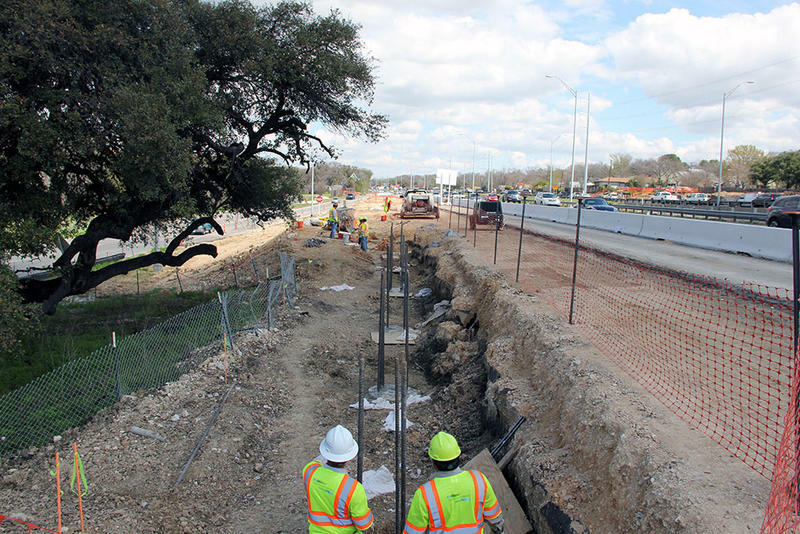 All around, you'll see construction — yes, these are new lanes being added to one of the region's busiest highways, part of the MoPac Improvement Project, which will add one lane in each direction from the freeway's northern end to Lady Bird Lake. These new lanes, however, won't be a part of the regular traffic. They will be tolled. "A lane that is variably priced, based on the amount of demand. The metric is, you want to try and keep traffic moving at 50 miles an hour, any time of the day. 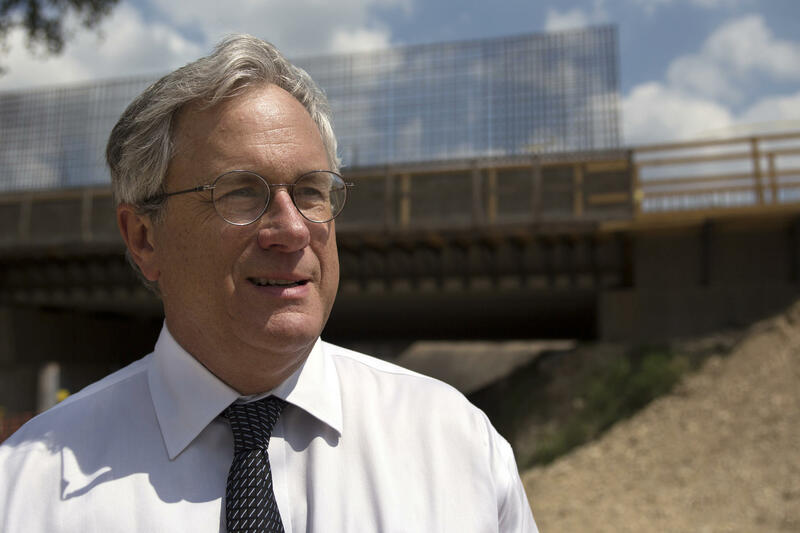 Even at 5 p.m.," Mike Heiligenstein, Executive Director with the Central Texas Regional Mobility Authority (CTRMA), tells KUT and the Austin Monitor. The CTRMA is a regional planning group formed by Travis and Williamson counties a little over a decade ago to help plan and build a regional transportation network. Fifty miles an hour during rush hour on MoPac sounds pretty sweet, but you'll have to pay for it (or ride transit — buses will get to use the lane for free). Heiligenstein says adding a normal, non-tolled traffic lane wouldn't have much benefit for long. "That lane that we add non-tolled would be just like the others within six months," he says. "You would gain nothing. You would gain a little more capacity, but you wouldn't gain any reliability." That's likely true for other Austin highways as well. Simply add a regular lane or two, and they'll fill up like the rest of them because it induces more drivers to get on the road. Soon you end up right where you started. MoPac is just one of many projects in and around Austin that will likely add tolled lanes in the coming decades. 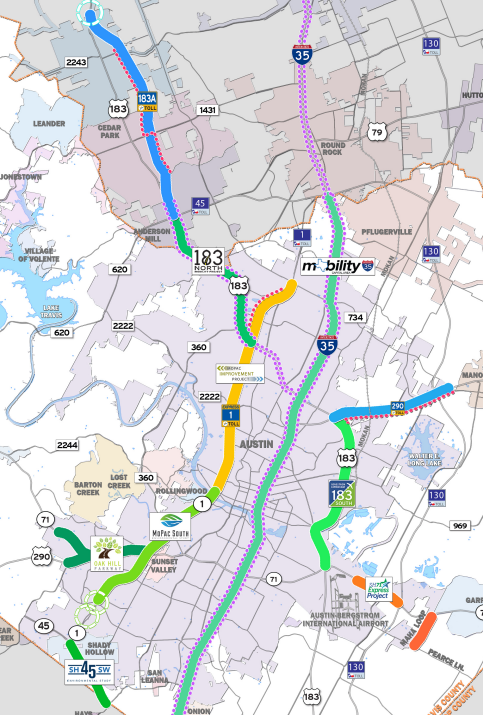 Planning or construction is in the works for more tolled lanes on South MoPac, 71, 183, they're even likely to be proposed for I-35. By 2040, if all goes according to regional transportation plans, nearly half of the highway miles in the region will be tolled in one form or another. 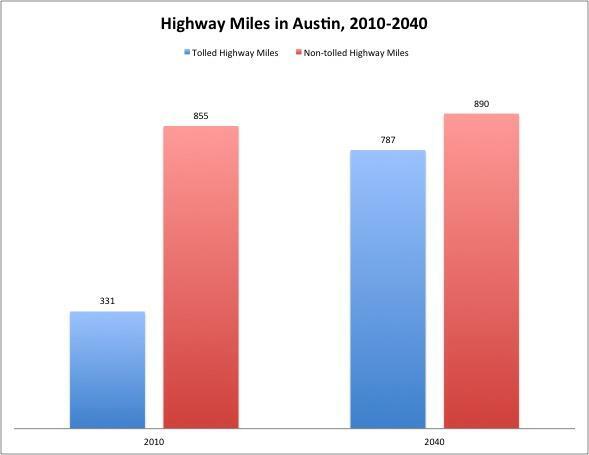 Tolled highway miles are set to more than double in the Austin region over the next 25 years, while non-tolled miles will barely budge. 'Express Lanes' are counted as tolled miles in this graph. And not everyone likes that. "No one likes tolls. 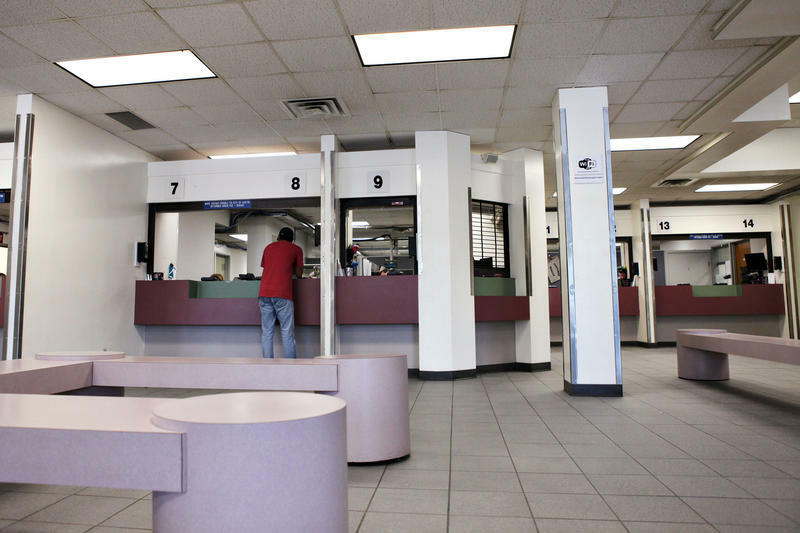 I don't like tolls," Austin Mayor Steve Adler tells KUT and the Monitor. "You know, we all want our roads to be free and available to everyone. But at this point, the federal government and the state government are not giving us a lot of options." The reason why Austin doesn’t get much help from the state or federal government for new lanes and roads is mostly a financial one. The construction and maintenance costs of roads have become more and more difficult to cover with a limited pot of state and federal money. Gas taxes haven't gone up at the state or federal level in over two decades, even though cars are getting more and more miles to the gallon, meaning lower revenues for roads. At the same time, road construction costs keep going up. So if the roads won't pay for themselves, the thinking goes, have the people that use the roads pay for them. A map of planned road projects in the Austin region, many of which are toll roads. Existing non-toll lanes will remain free. "It's a pretty fair system," says Machemel with UT. "I think we can pride ourselves on doing a pretty good job of financing transportation infrastructure through user fees. We've pretty much always done that. And that's true for the highway system – the gasoline tax is the primary source of those funds, and if you don't have a car or buy gasoline, you don't pay that tax." "The reality is that the cost of right-of-way, the cost of construction, continues to grow," says Tom Lambert, President and CEO of the Metropolitan Transit Authority of Harris County (METRO). "The more that we can manage the infrastructure that's already been built, and the more you leverage the benefit of multiple users using that infrastructure, the better off you're going to be in the region." METRO is a adding a single-passenger peak demand toll option to many of it's high-occupancy vehicle (HOV) lanes in Houston. It's expected that after a few decades, the tolls from the new lanes in Austin will have paid off the bonds for the capital costs, so whatever funds are left over after covering road maintenance will go into a regional infrastructure fund for other transportation projects. That could mean more roads, but CTRMA says the funds could go towards bicycle, transit and pedestrian projects as well. The price for these new express toll lanes on North MoPac will rise and fall based on demand, and there's no cap on how high the tolls could theoretically go. Critics of this kind of tolling call them "Lexus Lanes," because few can afford to pay, say, $10 each way every time they get on the highway, if that's what the price gets up to. But planners behind the project say that's ignoring the fact that the lanes are free if you're riding on transit or a registered vanpool, and the new tolled lanes add capacity, in a way, to the old non-tolled lanes, by removing cars and transit riders who want to take the express route. "My hope is, that people who are sitting in traffic and watching these buses [in express lanes] blowing past them, and some of those people will think about actually getting on that bus," says Adler, "and make the traffic move more quickly in the lanes that they just left." That has certainly been the case in other cities. In Houston, for instance, their commuter park and ride service saw a 4.2 percent increase in ridership. In cities like Los Angeles and Atlanta, people that choose to take the bus in the express lane can get toll credits they can later when they need to drive. Believe it or not, one issue that has popped up in other cities with express lanes is that they've proven too popular. Even roads with tolls as high as $15 have become quite busy. The major reason for that is that many express lanes in other cities offer toll-free rides to carpools or HOVs. That has led to more and more people carpooling, with lanes getting crowded and more congested than planners hoped. Houston has had to raise its HOV limits several times already for some of its toll lanes. In Austin, the express lanes on MoPac will not be free for HOVs, although the CTRMA is planning to encourage carpoolers to use the lane and split the cost. If they work out as planned, the new toll and express lanes could improve highway congestion and transit ridership while solving the region's problem of having to come up with its own road funding. It's a far cry from the traffic-free future of "Back to the Future 2," but it's certainly better a option than staying stuck in the past.